Once you get a taste for earning and redeeming points and miles, it's hard not to dig further into the mysterious waters of rewards programs and all they have to offer. Our answer: The Chase Sapphire Preferred® Card because of its great card benefits, flexible points and fantastic airline and hotel travel partners. There are dozens of loyalty programs offering incentives to sign up, and it can be overwhelming trying to compare the different loyalty plans, hotel chains, airlines, credit cards, and award charts to determine which programs offer you the best value and provide the best path to help you achieve your goals. If you're new to points and miles, you'll likely start off doing one of three things. Unfortunately, while each idea has its merits, you may be missing out on a lot of value. Here's why. 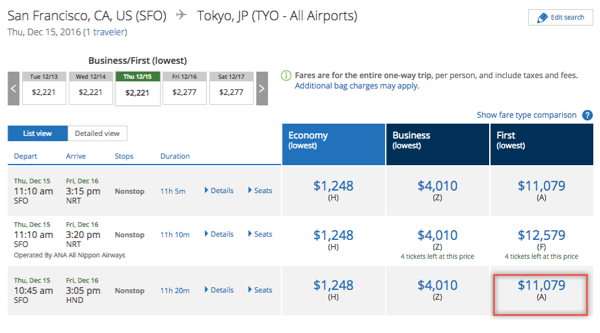 The largest points bonus can be misleading as not all points and miles command the same value. A mile with Delta SkyMiles is not the equivalent of an Alaska Mileage Plan mile. Simply put, some points and miles provide significantly better value than others. Depending on the loyalty program attached to a card, 20,000 bonus points in one plan may provide similar value to an equivalent 50,000 points in another program. Think of each point as a different foreign currency, each having their exchange rate. Although you may have a long-standing relationship with a bank, the products that they offer may not line up best with your individual goals. Each bank has its partners, and while they certainly hope your interests align with theirs, you might be better served elsewhere. Yes, you may live in Atlanta, the heartland of Delta, but does that mean you will get the most value out of having a Gold Delta SkyMiles® Credit Card from American Express as your first card? Possibly not. Particularly while you are making your first steps into the hobby of collecting points and miles, your first card needs to offer a variety of rewards and the right bonuses to make it a good daily spend card. 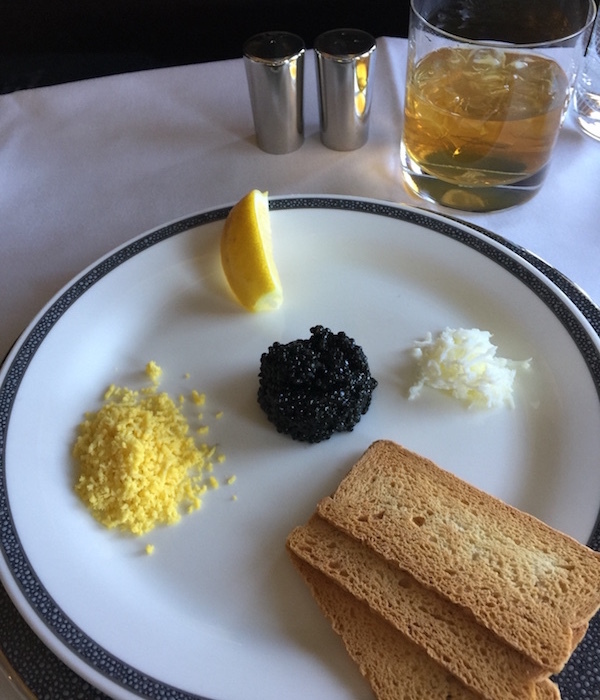 In reviewing why the Sapphire Preferred is the best beginners reward card, let us identify what to look for in your first premium travel rewards credit card. What Makes A Rewards Credit Card A Good Fit For Beginners? Let's dive a little deeper into why the Sapphire Preferred ticks the boxes on each of these points above. The Sapphire Preferred has one of the best welcome offers of any rewards card available today: Earn 60,000 bonus points. The value of those points only goes up when leveraging partner programs such as United or Hyatt. Adding the 4,000 points earned from your $4,000 spend (assuming you've not made any purchases that earn 2x points) to the 60,000 bonus points for meeting that spend means you'd net yourself 64,000 (4,000 + 60,000) Ultimate Rewards! The most lucrative value from the points often comes from transferring them out into partner programs. When you do this, you transfer your Ultimate Rewards at a ratio of 1:1 to partner programs where you can receive an exponentially higher return on your points. We'll dig into that shortly. The secret to earning rewards points and miles is not increasing how much you spend; it is changing your spending habits to get the most benefit from your current spending while trying to mitigate any extra costs and fees associated with achieving the minimum spend. $4,000 may seem like a significant minimum spend, but there are plenty of ways to ensure you hit that number. We won't go into all the options as it would require an entire post, but we have listed a few below. Pay your major utility bills and all weekly expenses. Although some large utility companies are stuck in the twentieth century and prefer you to link a bank account, most will now let you pay using a credit card. Power, phone, internet, cable, insurance, auto maintenance, fuel, daycare, pet care, and groceries add up fast and will contribute a significant chunk towards your minimum spend. Paying your taxes. If you time your application right, paying your taxes with a new card can often achieve the entire minimum spend in one go. Use a service such as Pay1040.com, in which case, the 1.87% fee (minimum fee $2.59) would be worth it to reach the minimum spend on a massive signup bonus. According to the IRS, those fees might be tax deductible. Consult a tax professional for advice on your particular situation. Use Plastiq to pay bills or make payments that won't accept credit cards such as mortgage payment or tuition fees. These services are only worth using while trying to meet the minimum spend on a big signup bonus. Note These fees these services charge (upwards of 2%) make them viable for meeting a spend requirement but not the best use for your everyday spend as the value of the points earned is negated by the fees paid. The points you earn with the Sapphire Preferred are Ultimate Rewards which are considered one of the most valuable points currencies for many reasons. Each point is equal to 1 cent when redeemed through the Ultimate Rewards portal; this is the minimum value you'll receive. If redeemed for travel through the Ultimate Rewards portal you receive a 20% discount on each redemption increasing the value of each point to 1.25 cents. 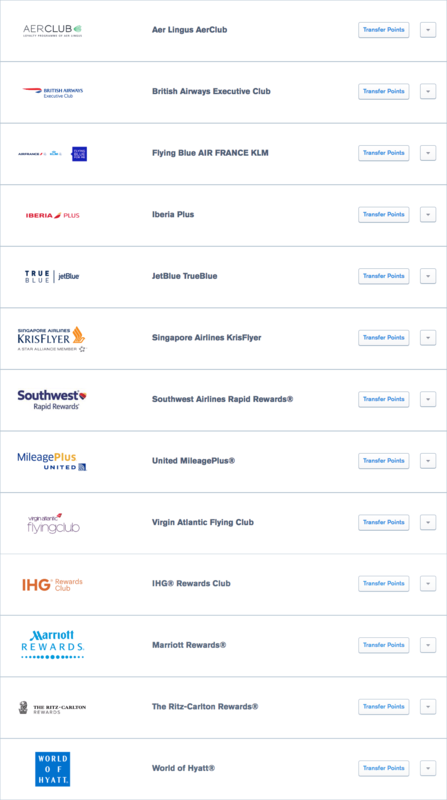 Points transfer at a 1:1 ratio to almost a dozen rewards partners some of which include Southwest Rapid Rewards, United MileagePlus, Virgin Atlantic Flying Club, Marriott Rewards, and World of Hyatt. 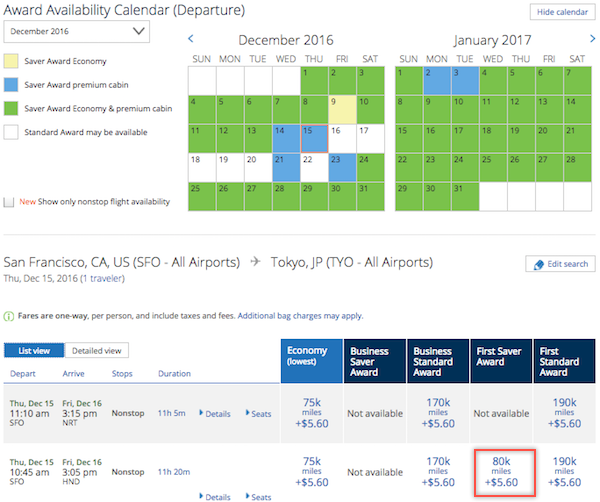 United MileagePlus – Transferring to United MileagePlus and booking First Class non-stop San Francisco (SFO) to Tokyo (HND) with a First Saver Award seat on December 15, 2016, will set you back 80,000 miles plus $5.60 in taxes and fees, while the same seat purchased with cash is $11,079. A value of over 13.8 cents per point! World of Hyatt – In a recent post on the value of World of Hyatt points, we profiled the Park Hyatt Mallorca, a category 5 property that can be redeemed for 20,000 points per night. In the post, we showed that the cash price for that room for three nights (July 14 – July 17, 2016) averaged just over $811 per night — a total cost of $2,435.17. 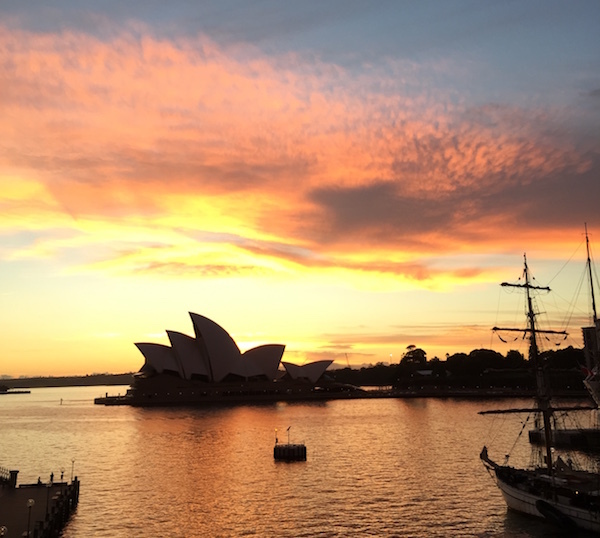 Alternatively, by transferring 60,000 Ultimate Rewards at a ratio of 1:1 to World of Hyatt for this redemption, you would receive over four (4) cents per point in value. While this was a great redemption achieving over four (4) cents per point in value, keep in mind that nightly rates at hotels fluctuate and you may receive more or less value from your points when it comes time to redeem. These types of examples are a perfect way for you to identify the best value for your points allowing you to benchmark redemptions against the available options. 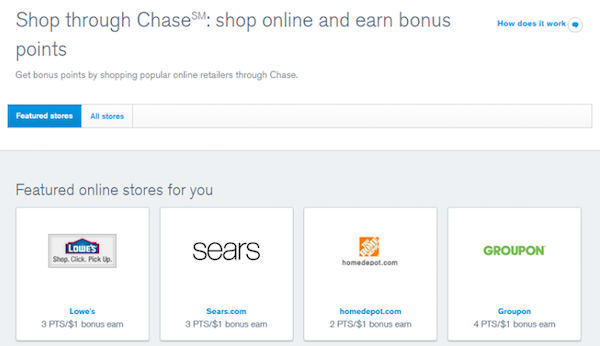 The Shop through Chase℠ portal features over 240 stores to help you earn up to 6x bonus points on purchases. Another easy way to earn points is using Shop through Chase℠, Chase's online shopping portal. With over 240 online stores, offering up to 25x bonus points earned for every dollar spent, this is an easy way to accumulate thousands of extra points every year. 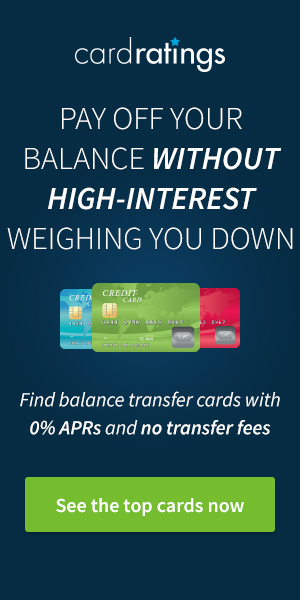 Chase has positioned this card on par with other top travel rewards cards. The Sapphire Preferred has an annual fee of $95. You'll also pay no foreign transaction fees when you use your card on purchases made outside the United States; so don't worry about using your card when you travel. The huge signup bonus and double points on dining and travel are fantastic incentives on their own but the Sapphire Preferred has a whole raft of advantages buried under the covers. It pays to read the Sapphire Preferred Guide to Benefits as these benefits are a significant reason you want this card as a permanent feature in your wallet. The Auto Rental (CDW) and Trip Cancellation and Interruption benefits, in particular, are fantastic perks. Auto Rental Collision Damage Waiver Decline the rental company's collision insurance and charge the entire rental cost to your card. Coverage is primary and provides reimbursement up to the actual cash value of the vehicle for theft and collision damage for most rental cars in the U.S. and abroad. Extended Warranty Protection Extends the time period of the U.S. manufacturer's warranty by an additional year, on eligible warranties of three years or less. Trip Cancellation and Trip Interruption Trip Cancellation insurance reimburses you or your Immediate Family Members for up to ten thousand ($10,000.00) dollars per person for each Covered Trip (up to $20k/trip & $40k/year) if a Covered Loss prevents you or your Immediate Family Members from traveling on or before the departure date and results in cancellation of the travel arrangements. Lost Luggage If you or your immediate family members' checked or carry-on bags are damaged or lost by the carrier, you're covered up to $3,000 per passenger. Trip Delay Reimbursement If your common carrier travel is delayed more than 12 hours or requires an overnight stay, you and your family are covered for unreimbursed expenses, such as meals and lodging, up to $500 per ticket. Baggage Delay Reimburses you for essential purchases like toiletries and clothing for baggage delays over 6 hours by passenger carrier up to $100 a day for 5 days. Travel Accident Insurance When you pay for your air, bus, train or cruise transportation with your card, you are eligible to receive accidental death or dismemberment coverage of up to $500,000. Yes, this may not be a top reason to get a credit card, but the Sapphire Preferred is one of the coolest looking credit cards on the planet. It's made of metal rather than plastic and is slightly thicker and heavier than other cards; it also has the numbers on the back leaving the front of the card a minimalists dream of smooth real estate dedicated to your name and the Sapphire Preferred branding. If you want to make a solid first push into collecting rewards points, it's hard to go past the Chase Sapphire Preferred® Card. It has the perfect mix of a fantastic signup bonus with an achievable minimum spend, first-class bonus points earning categories and Chase Ultimate Rewards® are some of the most valuable points to move between programs due to the 1:1 transfer rate with fantastic partners. I just booked a flight to Toronto from SFO on AirCanada through the Chase Sapphire portal. although most points fares are a bit higher than through the provider websites I found that I got nonstop flights through AirCanada that they do not even offer on their Aeroplan website. well worth the 3000 extra points. I still haven’t figured out how to transfer Sapphire points out to United…. Phil, once you log in to UltimateRewards.com, if you click on ‘Use Points’ and then ‘Transfer to Travel Partners’ you’ll be able to transfer. A really good comprehensive piece to start new collectors with…even if the cards and values change. This one should have a sticky to keep it always at the top! Great info. Thank you. I’m loving AwardWallet. Hi, I have read your review and I am interested in applying to this card but I live outside the US (I am not a US citizen) so I wonder if is still possible to have this credit card. Thanks! I wish we had more info on Canadian credit and Canadian credit cards. The systems in the two countries are vastly different — frankly, the system in the US is so different than everywhere else it’d be tough to keep up with anything outside of the US. We’d certainly like to be able to, but unfortunately the offers and opportunities are most lucrative in the US, so we focus on that. thanks for the quick response ! Its appreciated. I totally understand that its too much for any one group to be everything to everyone for rewards/points/credit cards etc.. but if you want membership money from non-US members.. it really doesnt seem that hard to ask to at least label things/adverts that are for US members only up front instead of making us all have to figure it out each time for ourselves (as many of your tips/deals are good for us all). Any thoughts of linking up/joint venturing with other groups that do address this non-US specific questions to some degree or adding them as resources for everyone in this boat to learn from ? An example for Canadian points being http://www.rewardscanada.ca. To me its not competition to you as you do offer different information and services – but you are better when used together. Karen, I appreciate the feedback. We’ll take it into consideration. We’ve got to look at the work associated and if it makes sense for us to do so. With so much of our market in the US, it is difficult to cover everyone and partner with others, while being good partners and making sure we don’t alienate our core base. Karen, appreciate your feedback. Thanks for reading. Happy to answer any of your questions offline at howie@awardwallet.com if you’d like to continue the discussion so we don’t hijack this thread. Hi, why do you send me an ad for this card when you can see from my profile that I live in Europe? You are wasting my time and your bandwidth. Both my wife and I got one of these cards. Great way to accumulate points fast and with the annual fee waived for the first years there is no extra cost (except for getting the min spend, which with 2 kids’ college tuition was unfortunately easy to do….) Will need to figure a no-annual fee one to transfer the points to if we don’t end up using them before the 1st year. Dan, you can always add your wife as an authorized user on your card account to consolidate all the rewards in one place, and then decide what to do from there. At least at that point you’ll have everything ready to go from a single location. Any idea about where your credit score needs to be for approval for the Chase Sapphire Preferred card? There is no magic number, however I always suggest before applying for any credit cards that you ensure your scores are safely over 700 on the FICO scale. When adding a spouse as an authorized user on one card of the account will a credit check be ran on that user? Or will the name and address just have to match indicating that is indeed the actual person being added? When adding someone as an authorized user a credit check or inquiry will not occur for that person. The credit card will however show up on their credit report going forward. If I add my wife as an authorized user to get the extra 5000 points, can she still apply for her own card for the 50,000 points and add me as an authorized user? I live in Australia. Will this card be ok here to use and is there a reason why qantas is not on your list of airlines. I am interested in the card but there are my concerns as above. Have a great day. You need to have a US Social Security Number/Tax ID to be able to apply. You must also have a valid permanent home address within the 50 United States or the District of Columbia to apply for this card. I already have Chase Ritz Carlton Reward Credit card and Marriott reward Credit card, can I apply for this Saphire Prefered Credit Card? Sure, as long as you’re otherwise qualified for the card, there is no restriction to having all of these. Couple of caveats to keep in mind. Business credit/charge cards from other issuers will not impact your 5/24 count as they’re not reported on your credit report. Also, not all Chase cards (Such as the Hyatt card) consder 5/24 in applications. Can points from the Chase Sapphire Preferred card be used for airlines other than those listed as airline partners? Donna, yes, they can be used just like cash. If you book travel directly through UltimateRewards.com, points you have associated with your Sapphire Preferred will provide a value of 1.25 cents each when redeeming for flights/hotel/etc. So a $400 plan ticket would set you back 32,000 points. Is there any way to transfer points to American Airlines? I’m not an expert on the military offerings that Chase has, however, it doesn’t appear that any of the rewards earned through these cards are Ultimate Rewards, which are the currency earned with the Sapphire Preferred and Sapphire Reserve. Sorry. 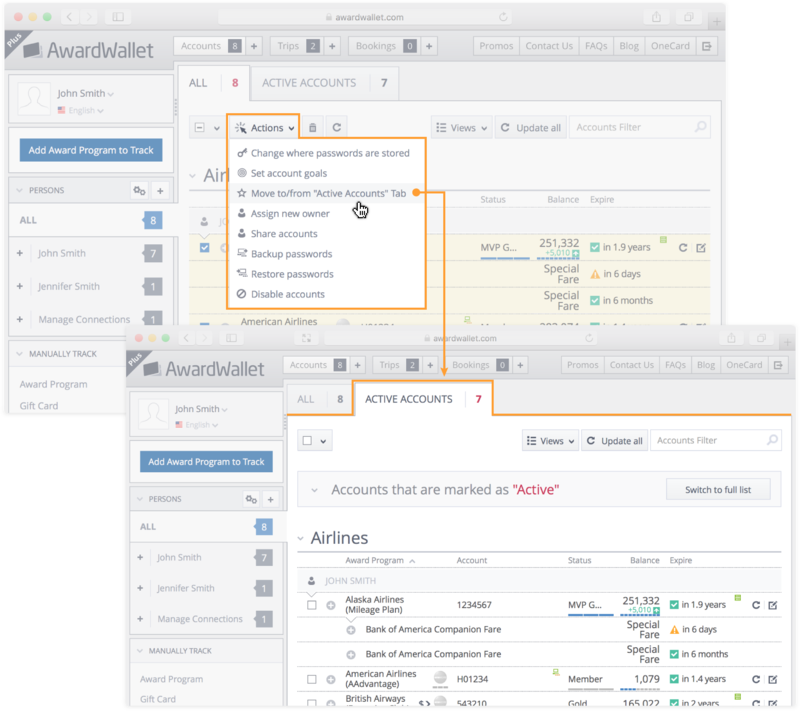 I would like to try using awardwallet but since bank points like ultimate rewards has the same unsername/password as the actual bank account, is it safe to use awardwallet to keep track such account. Thanks. Our almost 500,000 users say yes, it is safe. You’ll find that we focus on US credit card offers here as they’re the most lucrative across the world. Each country has its own setup and as messed up as the US financial systems may seem, they do provide a heck of an opportunity with travel rewards cards. Agree, this is a great card to have. Hi, I agree with earlier comments regarding including a note at the start of the article stating this is for US residents only. I don’t want to waste time reading something that is not applicable for us. I live in Australia. Glenn, you can safely assume that anything credit card related you read on this blog will be focused on the US Market only. We simply don’t have the knowledge, experience or offers in foreign markets to be able to cover them. Appreciate all the good information you provide. If it it only applies to the USA label it upfront. I have just signed on to Award Wallet and wasted my time reading all about the Saphire Rewards card only to find in the comments that it is not at all applicabe to someone living in Australia. LABEL IT UPFRONT PLEASE. No one likes having their time wasted. I now wonder if anything else you write is worth reading as it may not be applicable to Australia. And please don’t say “assume that anything ….” instead say it upfront. Malcom, I’m sorry your time was wasted and certainly don’t want to waste the time of anyone. Almost every credit card offer we cover here is U.S. only. I can appreciate your request, however, given our audience, we’ll continue to focus on the U.S. market. I’d suggest you skip past any credit-card specific content on this blog as it’ll likely be U.S. only. Unfortunately, the same could be true for many promotions we share as well. question on any of the travel reward cards not specifically aligned with an airline- do the reward cards offer free baggage and priority check-in? None that I’ve heard of. This card sounds great, but I wasted my time reading all the way to the comments before finding out it isn’t valid for Canadians. Why send me this email then promoting a product I can’t have. It’s a huge waste of time. It’s not like my profile doesn’t identify me as Canadian. Maybe update your mailout process and policy. In general, I’d absolutely agree — the challenge being is a lot of people don’t like the up-front fee and cost for authorized users. For someone that is just getting into the world of points and miles, the CSP is a solid starter card that additionally waives its annual fee the first year. I recently had to replace my sapphire preferred card due to damage. When the replacements came, it was identical except it didn’t have Chase Private Client on it. Does that mak a difference? It doesn’t at all. 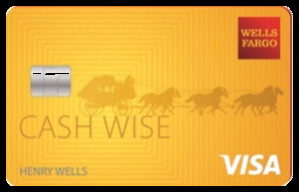 If you’d prefer your card to have that mark on it, I bet you could call Chase and request it.